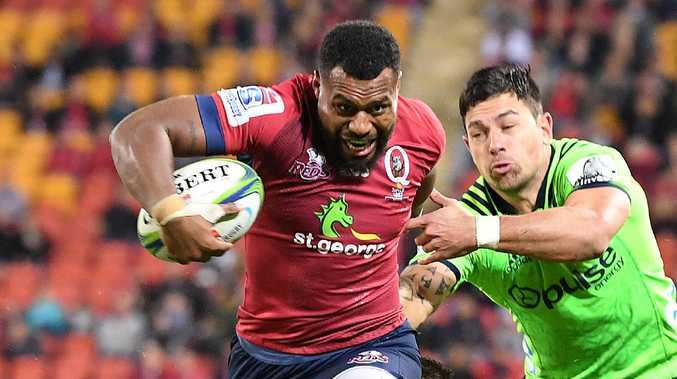 BRAD Thorn unveiled Wallaby Samu Kerevi as the new Queensland Reds captain when saying he held no ill will towards the trio of trumps he has moved on. Coach Thorn said he saw centre Kerevi as a "long-term captain" which has an exciting dimension because the bullocking match-winner is only signed to the end of this season. 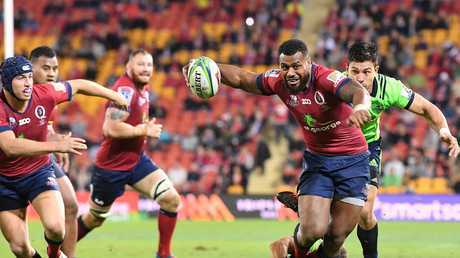 It augurs well for an extension of Kerevi's influence at the Reds where he has taken over from Scott Higginbotham as skipper. "I feel leadership brings out the best in Samu. 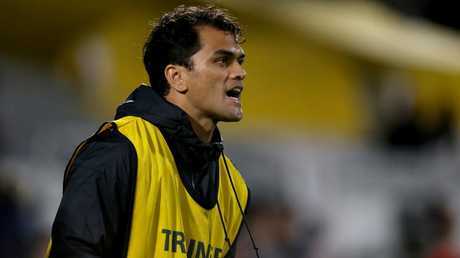 He was huge for us last year and I'm looking at captaincy over the longer term for him," coach Thorn said. "He's become a world-class player and his heart is there to serve the team which is a really big thing for me with leadership. "I had some conversations with 'Higgers', he was really gracious and will continue to be an important leader within the team." Kerevi's 25-Test background adds to his presence within the squad and he said it was a "massive honour" to get the captaincy full-time after a first taste of it in 2017. Thorn has too much focus on his young Reds squad and an improved Super Rugby season to be looking in his rear vision mirror at players no longer at the club. Thorn believes leadership will bring out the best in Kerevi. AAP Image/Dave Hunt. He still had to when the inevitable questions came but kept bat and pad as close together as Australia's new Test opening batsman would love to demonstrate at the Gabba this week. When Karmichael Hunt was finally unveiled this week as a NSW Waratah, it completed a year-long saga to reshape the Reds roster to meet coach Thorn's high standards. Former Wallabies prop James Slipper, after two cocaine strikes in out-of-competition testing, found a new home at the ACT Brumbies last September and unwanted flyhalf Quade Cooper was unveiled as a Melbourne Rebel last October. 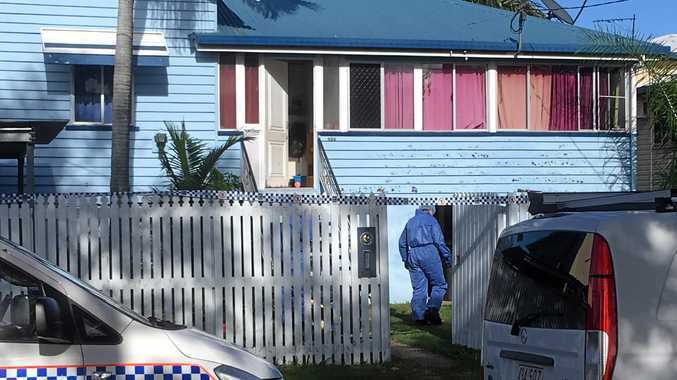 Whether fullback-centre Hunt would find a new home was the most drawn-out process of all ever since his arrest in December 2017 and drugs charges being dropped through lack of evidence. "It's fair to say it (2018) was a solid year and that describes many things," Thorn said. "You're talking about last year, I mainly want to be talking about 2019 and I feel the time has been used well with planning and prep for our two trial games." Improvements in defence, kicking and consistency are big areas of focus for Thorn's squad. When pressed again on whether there was any relief in resolving the Cooper, Slipper and Hunt distractions of last year, Thorn finally offered a little. The Reds have lost a host of experience. Picture by AAP/David Clark. "Not really, it is what it is. There is just good stuff going on here at the Reds and that's what I'm about," Thorn said. "I'm pleased for a guy like 'Slips' who is at the Brumbies. Karmichael is at the Waratahs. "I wish them all well." On Cooper, he later added: "I'm happy for Quade and wish him well too because he has had a tremendous connection with Will Genia and they'll enjoy playing together." The Reds meeting the Rebels in a trial at Ballarat on February 1 held no Thorn v Cooper twist in the hard-edge coach's mind. "I don't need people in other teams to want to win. It's just good to have a good trial against the Rebels ahead because these lead-ins to the season are really important," Thorn said.